Need help with your air ducts? Our company offers professional air duct cleaning services Schedule online today! You may have heard about air duct cleanings in the past, and possibly even air duct sanitation, but what do these services mean for you exactly? Also, why should you consider them in the first place? Our professionals are here to help explain it all to you! 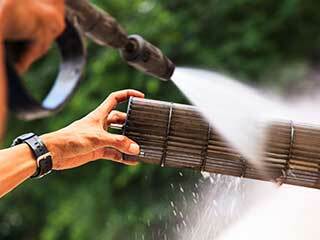 Air duct cleaning involves a technician or two coming out to your home (or business) and use specialized equipment in order to completely clear out the dust and debris that build up in them over time. These substances wind up clogging the duct naturally as a result of them being drawn in with air to be used by the system and getting trapped inside. There are various ways in which ducts can be cleaned, but a high-powered vacuum ensures that none of the disturbed particles can cross-contaminate with your home's air any further. What Is Air Duct Sanitation? Air duct sanitation is not about clearing out dirt and otherwise from the duct, and instead focuses on erasing potential diseases and bacteria that may be present in them. Pests can sometimes find their way into your ducts and even try to make themselves at home in them, but even once they're gone they leave behind potential health risks. Rodents in particular can have diseases in their waste that should be taken care of. What Is The Difference In Results? Air duct cleanings are what you'd want to get if you haven't gotten them cleaned out in a while and want to lower your energy spending and improve the air quality of your home. It focuses specifically on getting rid of the blockages in your ducts that are slowing down air flow and reducing energy, as well as polluting the air as it passes through. Sanitation can be a second step after a cleaning if signs of pests are found or done on its own after you've had pests exterminated from your ducts and want to make certain that all remnants they left behind are completely gone. It's a follow up after the pests themselves have been taken care of by animal control or otherwise. If you want to make sure you get reliable, cost-effective solutions, you must choose a certified, experienced and well-known service provider. Here's what you need to know to avoid mistakes and heartache. Thank you for choosing Air Duct Cleaning Poway! Until our appointment, check out our website for blogs, tips, FAQs and more!